The importance of military chaplains serving in war and peace. In Arlington National Cemetery, there is a section just for chaplains, many of whom died in war. I assume they went in with the troops on Normandy. But the scene above seems nuts to us as well: in the middle of an invasion, the ‘padre’ trying to find his communion set. Not to me, as a Pastor. He was called by the Lord to preach, teach and administer the Sacraments. A communion set is to help a Pastor to give the Lord’s Body and Blood to those who a sick and tired, sick and dying, and afraid in the middle of a war. ‘Spirituality’ is not a disembodied entity. True Christian spirituality is,”This is My Body given for you” and “This is My blood shed for you”and so serving our neighbor in body and soul and the “and” is a connective. 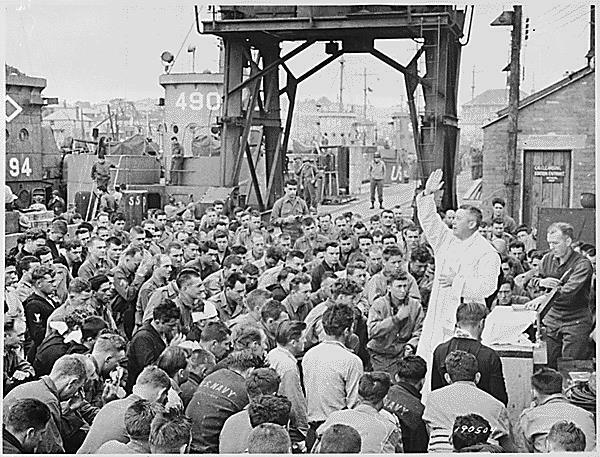 Keep in your prayers military Chaplains on this D-Day and as you are reminded of those in service to the Lord in our nation at other times. The following link is to a blog posting I dedicated to the Navy chaplain who officiated at my father’s funeral. Posted at Arlington National Cemetery at the time, he would do as many as six funerals a day, in any kind of weather. Pastor, Interesting clip…never saw that movie. Good thoughts on Chaplains. Our late pastor was an Army Reserves Col. For many years. We are near Ft. Dix. He was late to a meeting once and told me he was called to the base to help grieving parents with the loss of their son who committed suicide there. He was up most of the night with them. There are many things that Chaplains do during wars and peacetime. One of our members now has a Chaplain son serving. We keep them in out prayers.